Not many skincare products give overnight results, but when taking a look at my skin the morning after, I realised everything I had read about Sunday Riley‘s magical Luna Sleeping Night Oil was true. This oil promises practically everyone’s wish list when it comes to skincare – reduces pore size, improves appearance of damaged skin, helps combat wrinkles, does the list ever really end?! It even claims to help aid skin issues such as eczema, psoriasis, rosacea and acne. I can’t vouch for all of these claims entirely since I don’t suffer from all of these issues, lucky me, but I can hand-on-heart say that when I wake after having this on my face overnight, my skin simply looks like the best version of itself. Firstly, I notice that I don’t actually look as tired as I normally do, which sounds fairly basic but I think has the biggest effect on our skin and overall look. It’s as if I’ve had somebody giving me an 8 hour overnight facial and everything just sort of looks a bit tighter, probably due to its hydrating properties. I don’t suffer from dry skin but I can definitely tell when it’s looking slightly dehydrated and has that dull look to it. Luna just perks it right back up again. Secondly, if i’ve been suffering with any redness from blemishes and whatnot, after sleeping with this on my skin the redness is dramatically reduced, if not gone entirely. It also seems to reduce the size of the blemish itself if this is still trying to wreak havoc on my face. These are the most noticeable, morning-after application results but I’ve been using this now for about 3 months and I’d also say it is helping with the overall look of any sun damage and fine lines that have been creeping their way on to my face over the last year. This all sounds pretty dramatic and too good to be true, right? Well, unfortunately it sort of is. This wonderful blue tinted oil is a whopping £85 for 30ml. Now, obviously depending on your budget, this might be something you’d be happy to splurge on and I would say that if you do have the money and like to invest in your skincare then I would 100% recommend it. However if you’re under 30, a bit strapped for cash or just basically don’t want to spend £85 on a 30ml bottle of liquid, you probably can do without it in your life. For now at least. There are many more facial oils out there that have similar, bold claims for a more attractive price, I’m just yet to find one that works as well at this baby does. Any and all recommendations welcome! 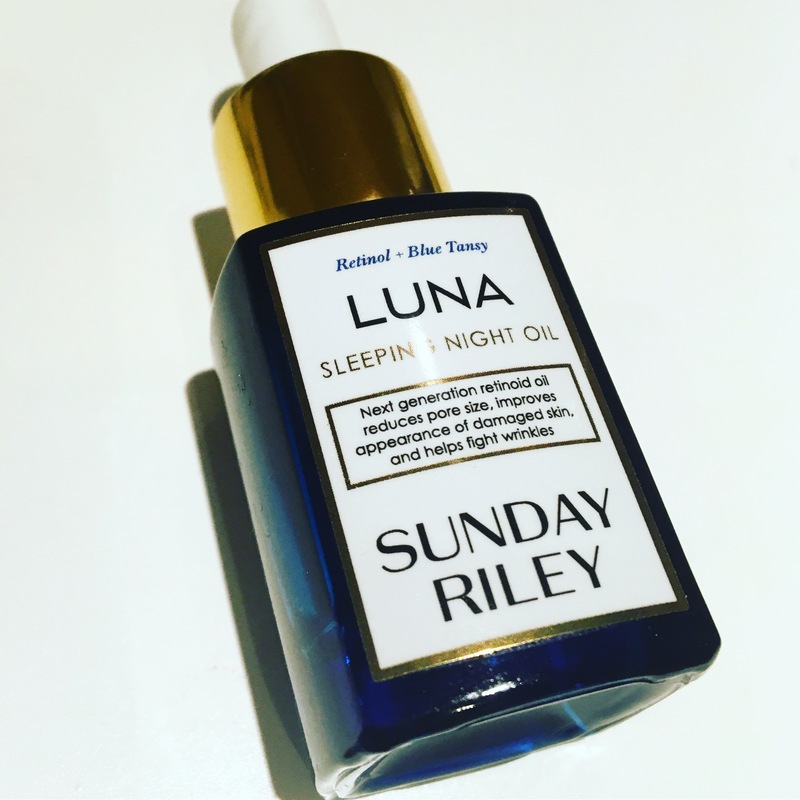 Luna Sleeping Night Oil and other Sunday Riley products are available to purchase online from Cult Beauty.